If your lubrication operation were a hospital blood bank, would patients feel confident that transfusions would sustain life, or would they envision a shorter life expectancy? The often-used analogy of lubricants as the lifeblood of equipment makes sense. People visiting a blood bank expect to witness sound organizational practices for receiving donations, testing the blood, labeling blood bags, proper refrigeration, controlled transfer to the hospital room and the use of sterile equipment for providing a transfusion. In short, the journey of the blood matters. To provide optimum machinery health, consider these five sequential pillars in the journey of a lubricant: arrival, storage, transfer, application and life cycle. When a lubricant arrives at a facility, whether in 5-gallon pails, 55-gallon drums, 275-gallon totes or tankers, the first step is to evaluate the condition of the containers. While the outside of a container does not necessarily represent its inside condition, it could potentially be cause for concern. For sealable and reusable containers and tankers, ask about the distributor’s cleaning and refilling procedures. Failure to flow a small portion of the lubricant through the nozzle of a cleaned and air-dried container might lead to contamination from detergent residue. Upon arrival, test the lubricant before accepting it to ensure it has the appropriate cleanliness and moisture levels. Although testing every container might not be realistic, obtaining a sample from random containers makes sense. Also, do not use a mason jar or other makeshift container to gather samples. Instead, employ disposable sample bottles intended for this purpose as well as disposable silicon tubing. Lubricant sampling and testing is essential from a forensic standpoint. Without a reference sample, diagnosing problems later in the life cycle becomes more difficult because there will be more variables to eliminate. Establishing a good relationship with an oil analysis laboratory can pay dividends. The lab may even offer complimentary reference sample testing services if it does not want cost to be an impediment to subsequent problem-solving. 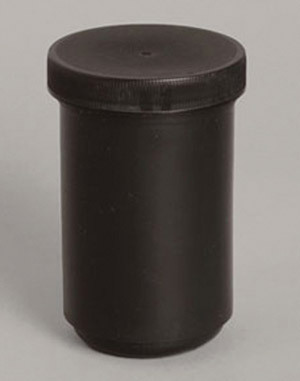 After receiving a lubricant, stamp the date on the container and use first-in, first-out (FIFO) handling practices to ensure constant rotation. While buying in large quantities can drive down the price, some of the lubricant may exceed its shelf life, especially in storage environments where it may be difficult to maintain the lubricant’s integrity, such as in extreme temperatures. Although some environments can make it challenging to protect against contaminant ingression, do not invite contamination by transferring pumps from one container to another or by leaving the bungs open. Some companies may want to store containers outside or close to the point of use because they view walking back and forth to a storage location as non-value-added activity. However, unwanted ingression can also include people. This is why the container storage area should have restricted access and not be open to all. There should be a balance between convenience and practices that could sacrifice the integrity of the lubricant. All satellite lubricant locations should maintain the same principles implemented in the main storage and handling area. The latest oil storage systems can effectively identify, transfer, store and dispense lubricants. They are an economical way to save space on the plant floor while keeping lubricants organized and contaminant-free. They also can eliminate the potential for mess and mishandling by keeping each fluid clearly identified with color-coded tags and labels. Some add-ons that can further boost a system’s value include a spill-containment kit, quick-disconnect kit, dedicated filtration, fire-suppression kits, stainless-steel tank upgrades for corrosion resistance and a fire-safety compliance kit. to the oil analysis lab. The transfer stage of the lubricant’s journey too often tilts toward disaster. A galvanized oil container might be better than a coffee can or soda bottle, but it still invites cross-contamination and misapplication. First, start with sealable, dedicated containers for transferring lubricant. Assigning a color-coding schematic to storage and transfer containers can further mistake-proof the process. Single-use, disposable funnels also eliminate another common source of particulate and cross-contamination. 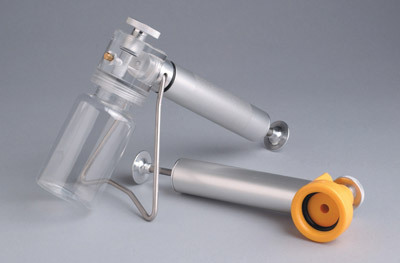 Vacuum pumps extract an oil sample from a sample port. oil samples from the most representative locations. Contamination control is key to maintaining the lubricating properties of an oil. Once water has entered the lubricant, it can exist in the form of dissolved moisture, emulsification or free water. Water damages oil and subsequently the machine surfaces the oil is designed to protect. To remove water and particulate contamination from oil, use a filtration system and/or filter carts. Desiccants and desiccant breathers can also remove moisture and prevent it from entering the oil. A bearing is not just a bearing, and a gear is not just a gear. Product designs may differ as much as the speeds and loads, not to mention the operating environment differences between Houston, Phoenix and Alaska. Gaining some “oil intelligence” from a lubricant analysis lab that has experience with thousands of installations can help an in-house reliability engineer and/or maintenance professional to evaluate applications and select the appropriate lubricant. It’s not necessarily that a particular lubricant is a poor choice, but rather that a better option often exists. Of course, selecting the right lubricant for the application means nothing if it ends up in the wrong place. 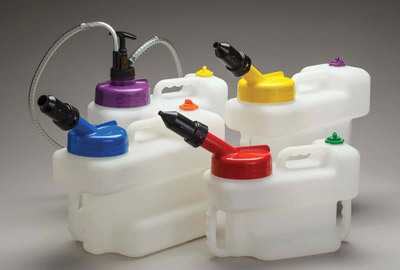 Again, it helps to use a color-coding system (or other unique identifier) that connects a lubricant with its application(s). Once delivered, the lubricant must be protected. Vented constant-level oilers remain the most popular choice, but a closed-system oiler can completely isolate the lubricant from the external environment. That said, pumps and bearing housings are inherently exposed to liquid. As much as possible, control ingression points with labyrinth seals and bearing isolators. Also, consider a desiccant breather to filter and dry the lubricant. Quick disconnects can enable personnel to connect the oiler to a filter cart and filter the lubricant while the equipment remains online or has been shut down for a maintenance procedure. Filtering the oil will help extend the interval between maintenance activities and/or a full drain-and-flush. The most effective maintenance programs incorporate routine lubricant sampling. Having the right sampling ports installed and sampling at the right place inside the machine are key factors for success. When and how samples are collected are two of the most important considerations in the sampling process. Without a representative sample, any further gains by analysis will not be possible. A variety of sampling ports and pitot tubes are available to assist in obtaining the best sample while the equipment is at normal operating speed and temperature. Combine a pitot tube with a level gauge to help keep a machine running optimally. Installing fixed sampling hardware is always the safest way for maintenance professionals to extract an oil sample from a piece of equipment that is in operation. To optimize long-term machine performance, work with an oil analysis lab that can pre-emptively spot signs of wear. Although thermography and vibration analysis can provide lagging indicators, oil analysis can offer the earliest warnings about things that potentially could go wrong. Supply the lab with as much information as possible about the application and the machine’s environment. To obtain information automatically, consider constant-level oilers that can wirelessly transmit oil level information. Accompanied by web-based applications, these devices can give real-time input on machine status and maintenance requirements. Other benefits include decreasing inspection times from hours to minutes, reducing the need for personnel to enter difficult or dangerous-to-access areas, preventing downtime with early warnings and having the ability to perform data-driven maintenance. When maintenance and operations personnel think of a lubricant, they tend to envision a specific application. Even a holistic concept such as total lubrication management can limit their thinking. However, by following the lubricant’s journey from arrival through its life cycle, you can see how every step offers an opportunity to implement preferred practices that mitigate risk. Those galvanized cans and funnels might be comfortable old friends, but your machinery deserves better.